« Why are cat tongues spiny? 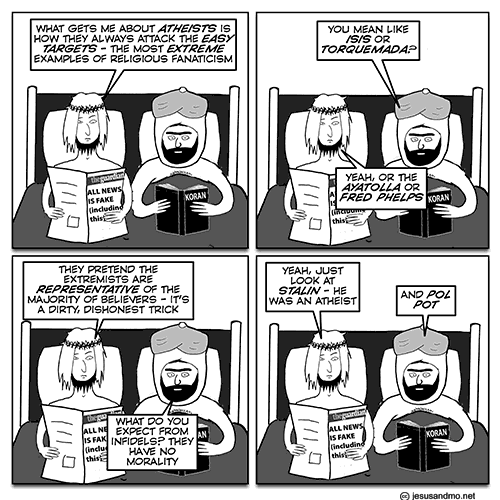 Today’s Jesus and Mo, called “trick-2,” is an eleven-year-old resurrection, but is still relevant today, since the tropes of Stalin and Pol Pot—not to mention Hitler—are still used to defend religion and attack atheism. The artist’s point is a good one, made even more trenchant by realizing that while ISIS and Fred Phelps damn others (and the former kills them) on the explicit grounds of religion, while Pol Pot and Stalin went after people not because they were atheists (there were a few exceptions), but mostly because those people opposed—or were said to oppose—a totalitarian regime. This entry was written by whyevolutionistrue and posted on November 28, 2018 at 10:00 am and filed under Jesus and Mo. Bookmark the permalink. Follow any comments here with the RSS feed for this post. Both comments and trackbacks are currently closed. And, as I’ve said before, Stalin, Hitler, and Pol Pot made themselves into gods — jealous, vengeful, brutal, and intolerant, just like Jehovah of the ancient Israelites. “I believe that it was also God’s will that from here a boy was to be sent into the Reich, allowed to mature, and elevated to become the nation’s Fuhrer, thus enabling him to reintegrate his homeland into the Reich. There is a divine will, and all we are is its instruments.” — Hitler, speech, April 9, 1938. Hitler was a Catholic who bragged about persecuting atheists. One of the more disturbing elements to religion is how it perverts history – such that the lessons it teaches are lost. With Hitler the lesson was how extreme identity politics, including the demonisation of minorities and fetishisation of “conservative family values” can lead to destruction. Nowadays however we hear that he was an atheist, mainly in a bid to convince us of how demonic those atheists are. I think history teaches it’s fundamental maxim very well : that history gets written by the victors. The level to which that is true is a measure of the comprehensiveness of the victory. Corollary : there is substantial presence of new-age Nazis in public life (UKIP, the latest name for the British Nazi Party, and I’m sure Transpondians can list their own examples) today ; therefore the alleged victory of the “Allies” against the Nazis in 1945 was pretty much illusory, and we’re going to have to do the job again. This time with nukes. I think I need to up my dosage of antidepressants. Rather prescient of the Prince of Peace to be reading “fake news” nearly a decade before our Dear Leader even coined that term. I had the thought that was penned in for the resurrection. Maybe prescience though. This is why I tend to generalize from religion to belief without reason, to include political ideologies and short circuit the Pol Pot argument against atheism. Even if you agreed that atheists attack easy targets, the appeal to Stalin, Mae etc. would be a bad one. Richard Dawkins addresses this in the foreword to the paperback edition of “The God Delusion” mainly pointing to the negligible numbers of benign religious people. I don’t entirely agree with his argument, but he has so addressed it.